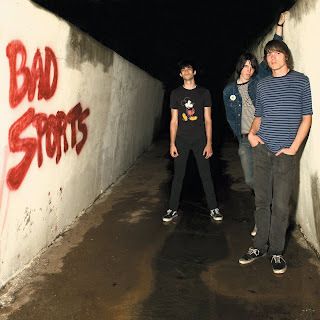 Bad Sports - S/T LP (DMR 035). Denton , TX is the equivalent for Douchemaster Records of a bar you can always go into and always expect to get laid afterwards. In this case she's particularly young and hopped up on speed. If you missed the two Bad Sports singles from 2008, then you don't know about their major league hooks and their seemingly unchallenged quickness. Bad Sports are a three piece that features TV's Daniel from Wax Museums and Greg Rutherford from High Tension Wires. Orville just sits around and writes most of the songs. Bad Sports are a bit more playful, but don't be surprised if this record reminds you slightly of The Reds or the first Marked Men LP. Their debut LP features fourteen songs, and the official release date is Nov. 17, 2009. 100 copies are available on split red and black vinyl. Wow! Awesome! I love Bad Sports! Is this record available on CD (or will it be)?